70 Series - Fully integrated mobile platform! 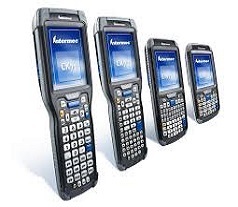 The Intermec 70 Series RFID is the no-compromise, next-generation family of ultra-rugged mobile computers that add passive UHF reading to the already impressive feature set of 70 Series devices. Fully integrated UHF RFID reader with no visible external antenna. Advanced RFID read performance in the industry's most compact, ultra-rugged design. Choice of three ergonomic designs, one common platform. Full compatibility with printers, application software, communications, peripherals, and accessories, thus integrating and enabling a comprehensive enterprise business solution. Exceptional battery life to eliminate downtime. Advanced imaging technology for remarkable scanning snappiness, tolerance to motion, and low light.